Our cardboard containers, it appears, are not just popular with people! 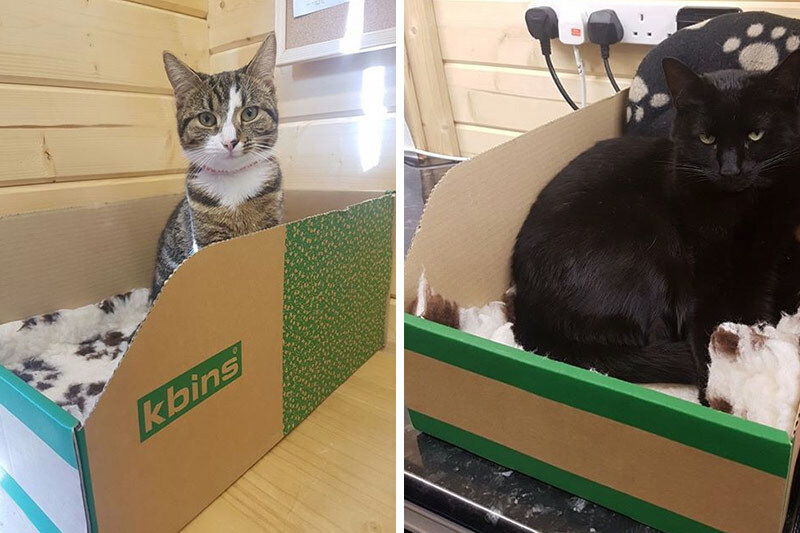 Louise, one of our customers and owner of business aimed at cat lovers, Cat Mad Gifts, contacted us to tell us that not only do our k-bins work well as stock containers, they also double up as "the best cat beds in the world!". Louise said "It is a good job the K-Bins come in packs, as soon as Jess (the tabby cat) pinched one, Milly (the black cat) also decided she wanted one, and believe me I tried an old Amazon box and she was having none of it! They like the front being lower than the back, I think." Also mentioned was that the k-bins are the perfect size to sit on a desk, meaning cats are are easily available for stroking whilst working. Acting as an anti-stress kitty! We love that Louises feline friends selected our cardboard containers as their bed of choice. Wishing them many more purrfect days and nights sleeping safe and sound.